Professional ‘mermaids’ are increasingly in demand in Florida’s luxury resort areas, earnings begin at a low wage of $10 an hour (based on reports in 2017). 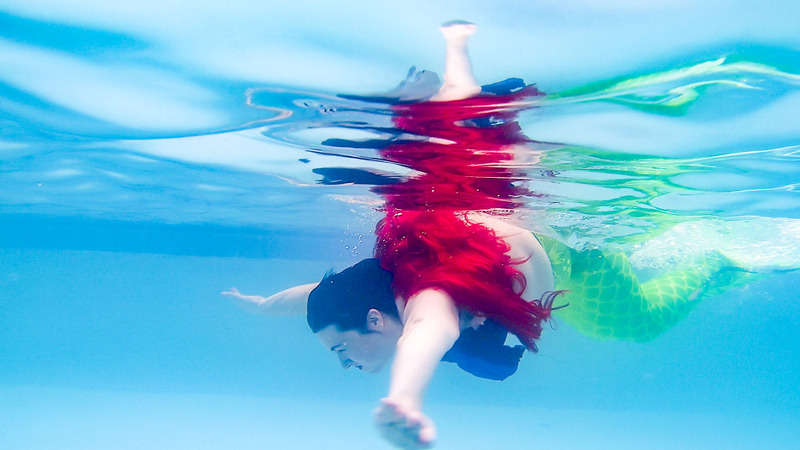 In Miami, I underwent a mermaid training course at an upscale hotel pool. 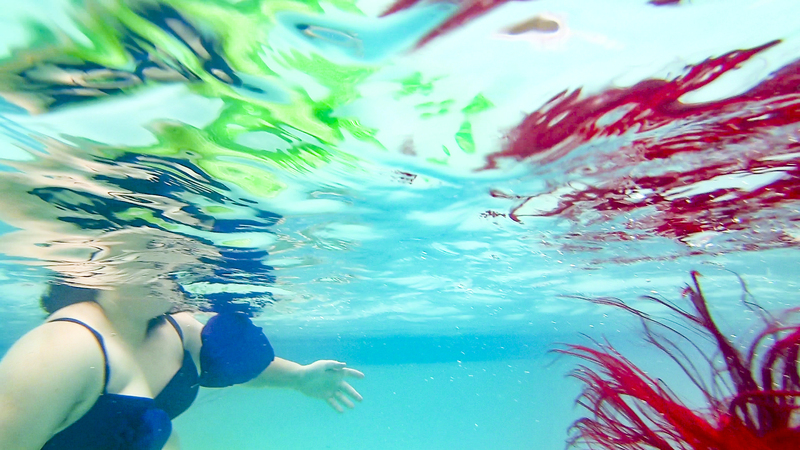 Awaiting my lesson with two instructors, I squeezed my body into the elastic fishtail. My lung capacity was tested as I de-performed the Disney-Pop cartoon high femme sea-to-land princess in what I like to call high-femme-Pop-drag. 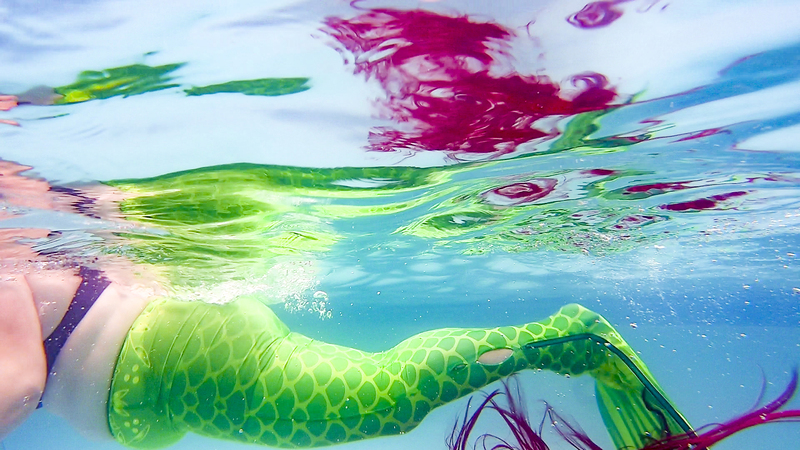 In the re-animation of the character of ‘Ariel’, I question the flawed psychology propagated by Disney. The trauma of many people enduring decades of racism, sexism, genderism, ageism, consumerism and body shaming is sadly engendered through mainstream media (like Disney). As a womxn, artist, and mama I am exhaustively ”treading” in our contemporary landscape. The training is physically & emotionally intense; my body responded awkwardly and opposite to what was being ‘taught’ to me as simple gestures. It became apparent that these two women practiced for many hours to perfect the mermaid “dance”. My wig floats away on impact, the fishtail rips exposing the natural curves of my calf, hand-sewn padded sea shells burst from my bra. 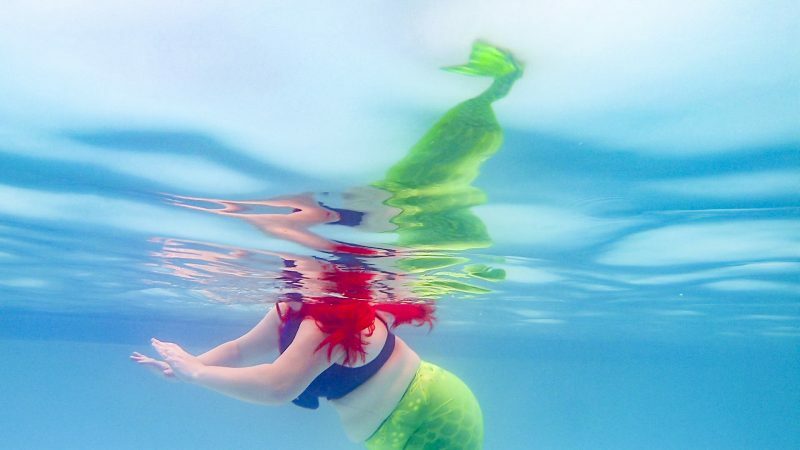 With my ankles tied together, the mortal danger of drowning while maintaining stylized movements and holding my breath underwater…demonstrated the confusing attachment “American culture” has to the image of the mermaid. I try to become this pelagic character. I ponder broader consequences of animal and human life with the rising tide and environmental catastrophes along the coastlines of planet Earth. The lively animation of this human/fish/mythical/character reifies my experience of walking through dead coral reef remnants washed up along the Miami coastline just the day before. As both subjects came to meet in this concept, the assertion I make through this work is that we are continually confronted with the hardships and complexity of ‘real life’ amidst the framing of contemporary cultural politic. Could the recovery of the ecosystem be inadvertently linked to my desperate attempt at re-visioning childhood ideals? What kind of planet am I leaving for my child and future generations?